The cameras had already been operating in many towns and counties by then, if illegally–local governments did not have the authority to operate them until the 2010 law. 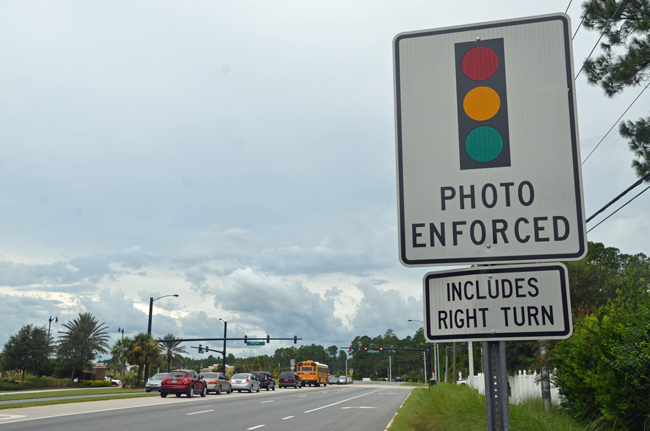 Palm Coast began using cameras in 2007 and would have still been using them this year but for a growing public and legal backlash against their use. The city had a contract with American Traffic Solutions that originally ran to 2019. But the city council voted to end the cameras in 2017. At the program’s peak, there were 38 cameras in operation in Palm Coast. The current council has no plans to revive the program. Rep. Fentrice Driskell, D-Tampa, cast the lone vote Wednesday against the legislative proposal, which is filed for consideration during the legislative session that starts March 5. People hate this law because it’s a fraud and largely for revenue. How many serious T-bone accidents are caused by people going right on red? I suspect very few but the overwhelmingly majority of tickets are for going right on red. Change it to tickets for going straight or left thru red lights and resistance to the law would mostly cease to exist. Until then it’s a fraud. The state takes huge chunks of money for themselves from the red light cameras. They will soon realize how much money the state has lost and will continue to lose if they continue to ban them. Then WE will have to make up for the loss through fees and taxes. Having the cameras was a good thing for several reasons Yes the Palm Coast also made some money off them but it had to go to road repairs, and safety features and things like that. Now that the camera money is gone, Palm Coast has to get the money from somewhere else. At least when we had the cameras, all the red light runners and other violators got to contribute to the roads and take some of the burden off the ones that were’t violating. Plus the cameras could tell who was at fault in an accident, which was a big help to insurance companies and the driver who was not at fault . There were some people who were upset and tried to claim the cameras took away their privacy. Wherever a person goes, there are cameras and even if you take a walk in your neighborhood, there are plenty of Ring doorbell systems recording you from different houses. People got upset if the vehicle got a ticket when the owner wasn’t using the car. If someone’s wife,kids, or friends are using the car wrongly, then don’t let them drive it. No ticket. problem solved. It’s really sad that people who are doing wrong things complain the most about the cameras and obviously don’t like to have to obey the rules. I happen to like red light cameras,however,thats because I drive correctly. When I come to a red light ,I stop. I dont think I am so important and so full of myself that I drive through a red light without even slowing down.I think it is a good idea that people who violate the law get their picture taken and get a ticket in the mail.I just saw an accident yesterday where someone didnt stop on a red light and ended up getting hit. Nothing is so important that you have to be in such a rush ,go through a red light and cause a wreck. It is time to ban them all. This prevents towns like Palm Coast, from implementing a knucklehead deal deal with unscrupulous organizations who only wish to steal from the taxpayers. It’s about time. Stop the insanity. Half the people like them- obey laws most of the time, see them as silent “traffic police”, insurance companies like them, and have no qualms with authority. Half the people hate them- “Big brother is watching”, hates authority, sees them as plot to steal money from taxpayers, insurance companies hate them, and causes accidents. Now we have cameras at almost every intersection for “traffic control”. They still can be used for tracking criminals from one place to another, whether consumers like it or not. Well, I don’t care either way as I follow the red light law. Until you or someone you know gets killed or maimed in a red light infraction, you are against this law because of the above. Common sense,( I see disappearing every day) has taken a back seat to politically correct. If you really feel like that the people complaining are the ones that are breaking the laws, then why don’t you install a device in your car that automatically sends you a ticket when your car goes just one mile per hour over the speed limit. Let’s say that you are going to Publix and are traveling 36 MPH. That will trigger a ticket. Let’s say you aren’t using cruise control and during the course of a half mile, your car goes 36, 34, 35, 32,38,35, and 37 MPH. That would be three tickets generated in the course of that half mile. Guess what, it gets better. You don’t know about these tickets until they appear in your mailbox thirty days later. By that time, you have driven this way for a month and well over three hundred tickets are on the way to you. Your stance was that you shouldn’t break the law. I believe overwhelmingly, that most people’s stance is that it should not be automatically blindly enforced and that the state can’t take away the human element when enforcing. People have a fundamental right in the United States to face their accuser. We don’t live in a Police State.